When hotel booking sites first appeared on the web, they were a godsend. 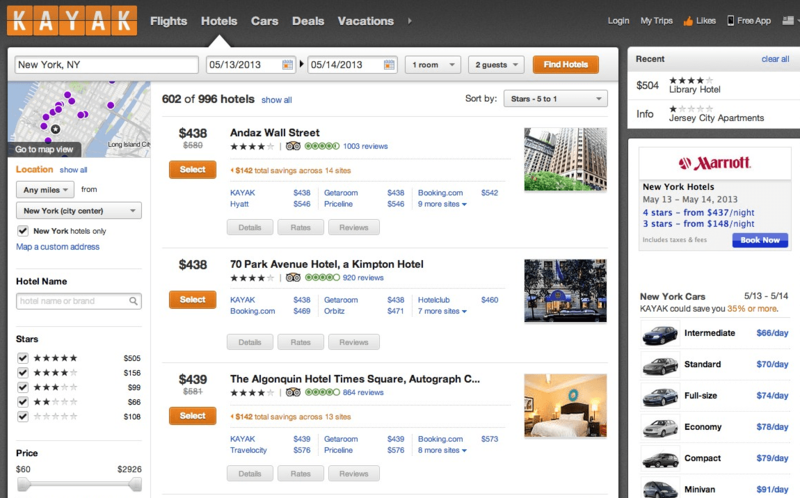 Suddenly, you could look up rates, availability, reviews AND book reservations all in one place. But now that online travel planning is a given, we expect more. The best travel sites not only offer the cheapest rates but also a plethora of usability features that can make all the difference to finding the perfect hotel for your trip. 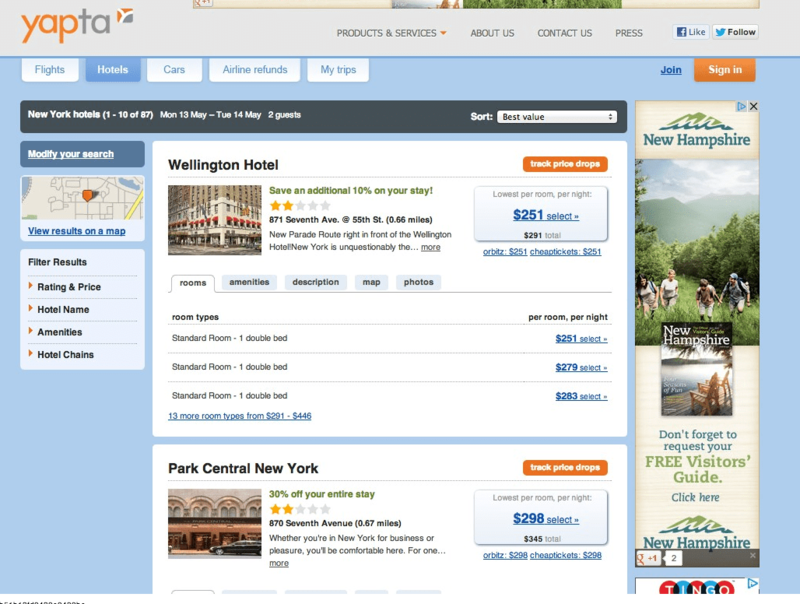 Which hotel booking site is best for travel planning? You decide. 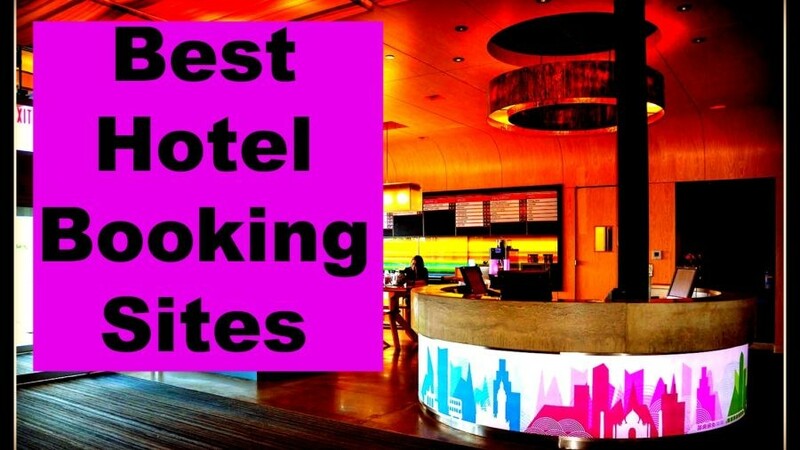 Then see hotel booking tips to get the most for your buck. 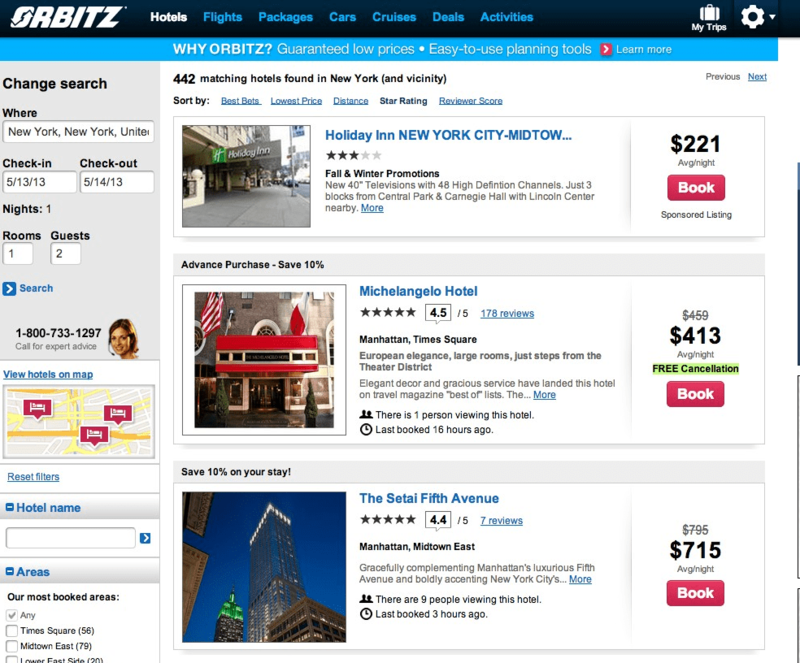 With over thirty hotel booking sites, and new ones popping up all the time, let’s start with the ones that are most widely used according to Tnooz.com’s list of top ten travel sites in the U.S. as of February 2013. Search results*: New York City – Same Day – 374 (out of an inventory of 515 properties) available, including Omni Berkshire Place, Midtown East – Grand Central, $279. Found in Daily Deal “A Sudden Amazing Price” Comfort Inn, Midtown West, $137. Advance Booking – 430 properties available, many offering free cancellation, including The Library Hotel in Midtown East, $440. Lake Placid – Same Day – 9 (out of an inventory of 21 properties) available, including High Peaks Resort, $139. Advance Booking – 15 (out of an inventory of 21 properties) available, including Mirror Lake Inn, $230. Added value: Beautifully visual itineraries on mobile platforms provide live access to up-to-date travel data like airport maps, flight status, cruises, destination services, confirmation codes and addresses. Itinerary sharing available via email and SMS. Customer Support by phone 24/7. Drawbacks: Note – Some frequent hotel guest programs do not offer perks and accrual of points when booking through third parties. Search results*: New York City –Same Day – 383 hotels available, including Omni Berkshire Place, Midtown East – Grand Central, $279. Found in Express Deals: 5-Star Hotel in Times Square – Theatre District, $386. Advance Booking – 507 properties available, many offering free WiFi and free cancellation. Found: The Library Hotel in Midtown East, $439. 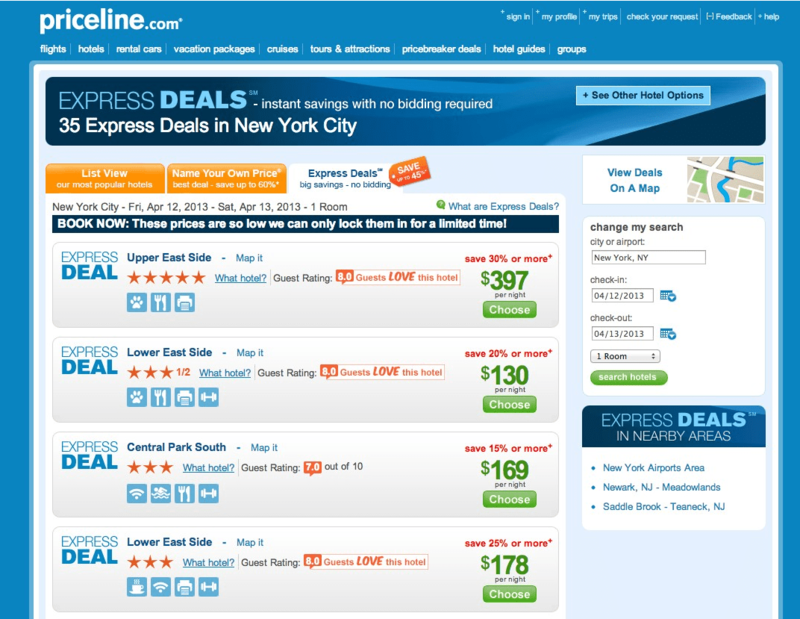 Express Deal: 4-Star, Times Square – Theater District, $236. Lake Placid – Same Day – 52 hotels available, including High Peaks Resort, $139. Advance Booking – 64 hotels available, including Mirror Lake Inn, $245. Found in Express Deals: 4-Star Hotel $120. Added value: Save up to 60% on hotels with Name Your Own Price® or book an Express Deal to save up to 45% without bidding. Customer Support by phone 24/7. 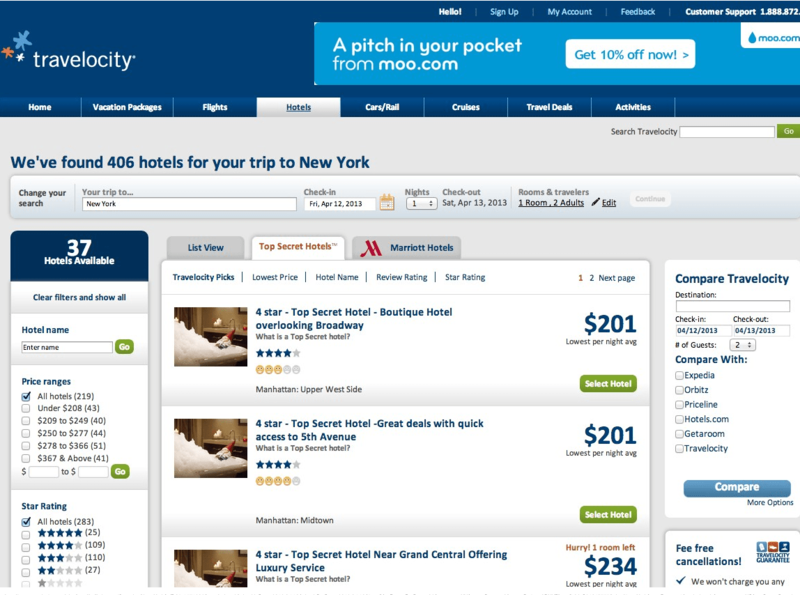 What’s to like: Online travel agency Travelocity searches draw on a database of over 17,000 hotels. Search filters include: price, hotels shown on map, area (airports, neighborhoods,) hotel name, star rating, review rating, hotel promotions, and amenities (WiFi, Pool, Free Breakfast, Fitness Center, Business Center, Convention Center, Dining, Laundry, Eco-Friendly, Executive Floor, Golf Course, Health Spa, Interior Corridors, Hot Tubs, Kids Activities, Kitchenette, Pets, Room Service, Tennis Courts, Wheelchair Accessible.Partner sites include LastMinute.com and IgoUgo. Search results*: New York City -Same Day – 246 hotels available (out of 406 properties,) including Omni Berkshire Place, Midtown East – Grand Central, $279. Found in Top Secret Hotels: 5-Star Hotel in Manhattan, $560. Advance Booking – 430 properties available, many offering free cancellation, including The Library Hotel in Midtown East, $440. 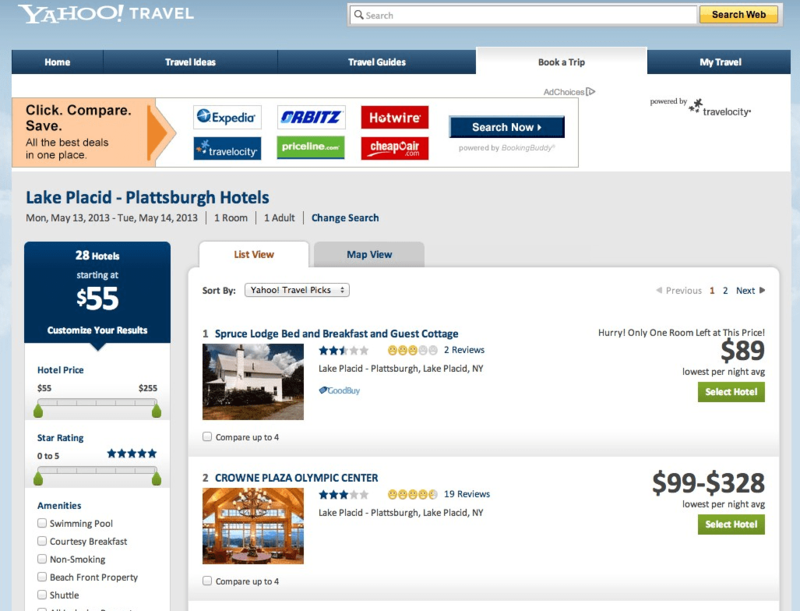 Lake Placid – Same Day-Showed 28 hotels available, but only listed the price for one 2-star property. Drilling down brought up High Peaks Resort at $125. Advance Booking – Again, 28 properties were listed, with only one 2-star property showing a price. No 5-star properties were listed, and the only 4-star properties were High Peak Resort ($125) and Whiteface Lodge, $251. 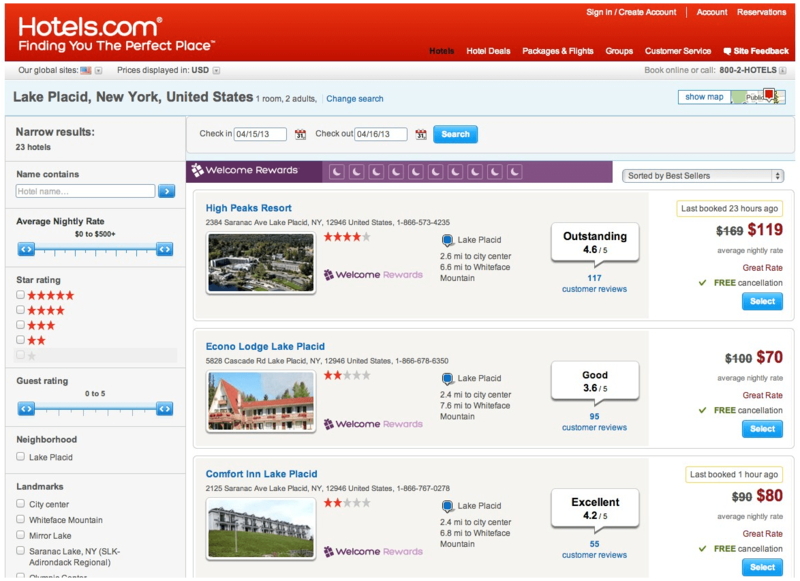 Added value: Both Travelocity and TripAdvisor review ratings appear on listings, with option to compare search results to: Expedia, Priceline, Getaroom, Fly.com, Marriott, Orbitz, Hotels.com, and Hotwire. Book Top Secret Hotels at discounted rate, hotel name revealed after booking. Customer Support by phone 24/7. Added value: Price Alerts – Receive email updates and notifications of the latest hotel prices. Mobile app provides a number of handy add ons, including: trip agenda, flight tracker, airline directory, airline fees, airport information, packing lists, and currency converter. Drawbacks: Booking is completed on Expedia, but with prices shown on Kayak. 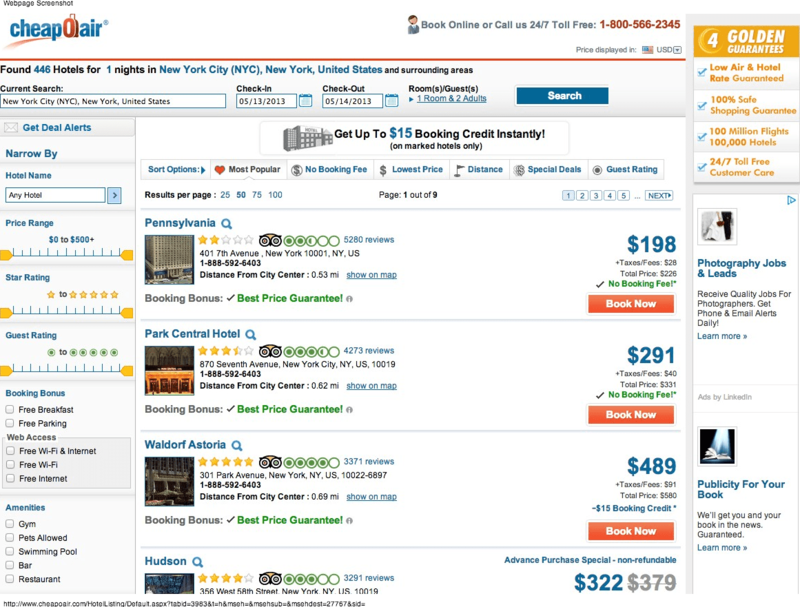 As we found, sometimes this results in paying a higher rate than if doing the search directly on Expedia. Note -Some frequent hotel guest programs do not offer perks and accrual of points when booking through third parties. Platforms: Web, iOS, Android, Windows Phone 7, and Kindle devices. Search results*: New York City -Tonight – 371 available hotels; the Omni Berkshire was not listed , but a number of comparable properties came up, including Eventi – Kimpton Hotel, Chelsea Theater District, $349. Advance Booking – 430 properties available, many offering free cancellation, including The Library Hotel in Midtown East, $440. 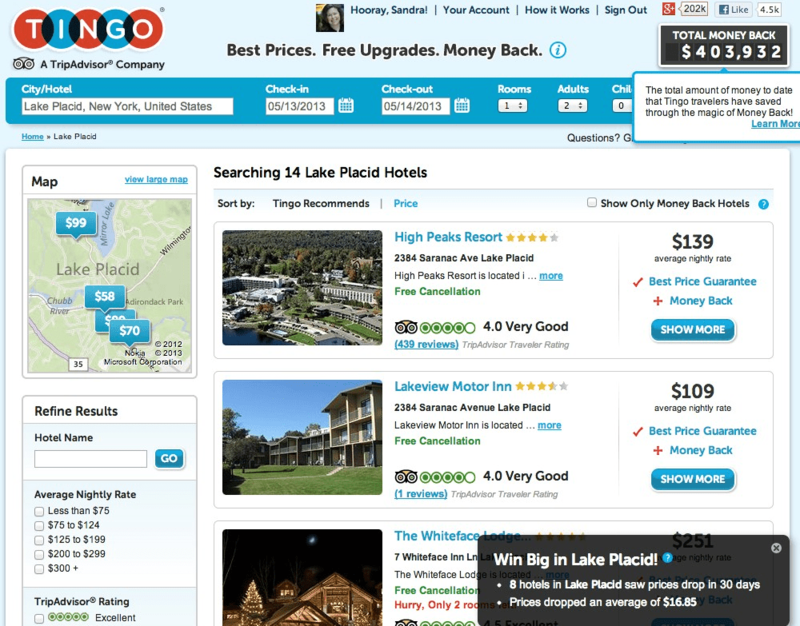 Lake Placid – Tonight – 10 hotels came up, including High Peaks Resort, $139. Advance Booking – 14 properties came up, including High Peaks Resort, $139 and Whiteface Lodge, $251. Added value: Deal alerts for members (free email listing.) Mobile app provides a number of handy add ons, including: currency converter, baggage fees, packing lists, and travel tips on a community blog. Customer Support by phone 24/7. Added value: Travel alerts with members-only hotel discounts. Price assurance (receive credits if another Orbitz customer books the same itinerary for less.) Mobile-only discounts. Search results*: New York City –Tonight – 235 properties, including a 5-star hotel in Midtown East, $410 (listed as $695 on other sites.) Advance Booking – 243 properties, including a number of hotels with published rates such as Eventi – Kimpton Hotel, Chelsea Theater District, $469 (seen at $349 on CheapOAir.) Lake Placid – Tonight – 1 Hot Rate: a 2.5-star property $75; 7 published rates, including High Peaks Resort $139. Advance Booking – 2 Hot Rates, including a 3-star property $84, and published rates such as High Peaks Resort $139 and Whiteface Lodge $251. 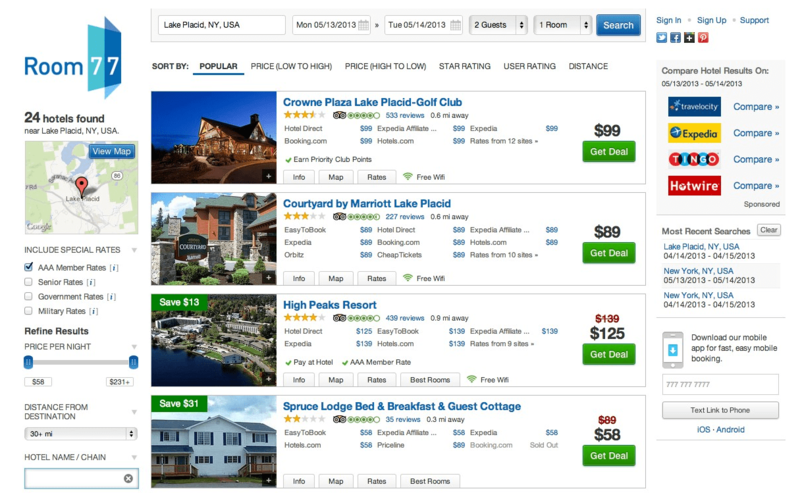 Added value: Trip Comparison Tool (Expedia, TripAdvisor, Hotels.com) Groupon Getaway Deals. Trip Watcher (Tell Hotwire where you would like to go within a 60-day range you specify, and they’ll watch all those dates for you at once to find your low-priced travel days.) TripAdvisor hotel reviews. Search results*: New York City –Tonight – 246 properties, including Omni Berkshire Place, Midtown East – Grand Central, $419. Advance Booking – 246 properties, including The Library Hotel in Midtown East, $440. Lake Placid – Tonight – 18 properties, including High Peaks Resort $139-159. Advance Booking – 28 properties, including High Peaks Resort $139-$179 and Whiteface Lodge $251-$677. Added value: Time-based travel plan on the mobile app. Pulls up searches on comparable hotel booking sites. Secret hotel deals – deep discounts, hotel names not available until after booking. Featured travel articles. Customer Support by phone 24/7. What’s to like: Multisite search engine BookingBuddy pulls up listings on: Agoda, Booking.com, BookIt, Hotwire, Trivago, Priceline, Room 77, Marriott, Orbitz, Tingo, Kayak, Hotel.com, Expedia, and TripAdvisor, and more. Drawbacks: Depending on your needs, it’s either a benefit or a drawback that Booking Buddy is basically a gateway to other search engines. What’s to like: Get the Deal Experts on Travel Zoo to find impressive savings on featured hotel deals. 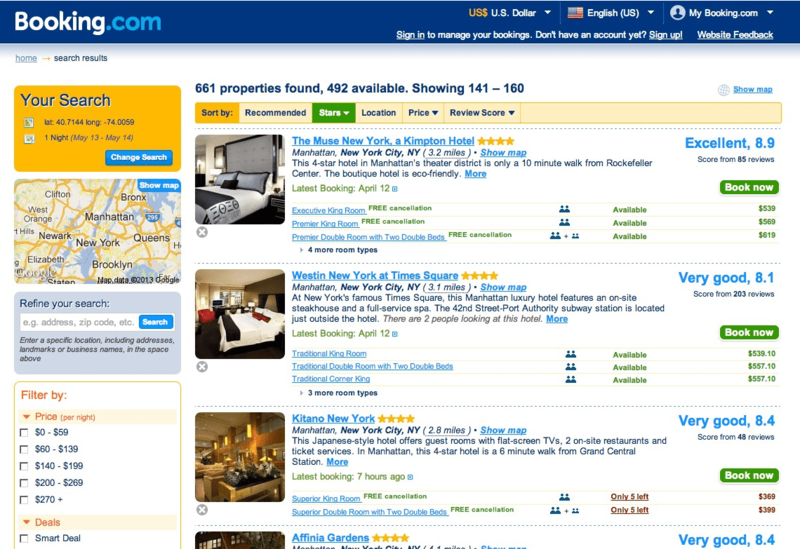 Multisite search engine pulls up listings on: Agoda, Booking.com, BookIt, Hotwire, , Priceline, Room 77, Marriott, Orbitz, , Kayak, Hotel.com, Expedia, and TripAdvisor, Fly.com, and more. Added value: Get local deals via email. Drawbacks: Again with the gateway to other search engines. Note – Some frequent hotel guest programs do not offer perks and accrual of points when booking through third parties. Search results*: New York City – Same Day – 296 (of 434) properties available, including Omni Berkshire Place, Midtown East – Grand Central,$389 via omnihotels.com. Advance booking – 307 (of 434) hotels available, including The Library Hotel in Midtown East, from under $480. Lake Placid – Same Day – 30 properties, including High Peaks Resort, from under $130. Advance Booking – 30 properties, High Peaks Resort $129-$295, Mirror Lake Inn $218-$464, and Whiteface Lodge $204-$$610. Added value: Price Your Stay – Multiengine search includes pricing on the hotel’s website. TripAdvisor is an excellent resource for planning the entire trip; in addition to hotel reviews, it has restaurant and attraction reviews as well as area guides. Search results* The beauty of Hipmunk is that although it will pull up as many properties as what can be found on TripAdvisor, its interactive map will only highlight a few at a time, which is great for zeroing in on where you want to stay. So, for example, if you’ve enabled Google Calendar, you might see the best hotels near the conference you’re planning to attend. In our searches, Hipmunk brought up all the hotels that were found using other search engines, but because it was on an interactive map, it was easier to determine if the location was acceptable. New York City –Tonight – The Omni Berkshire Place, Midtown East – Grand Central, is shown as available to book on Priceline for $279. Advance Booking – The Library Hotel in Midtown East comes up, available to book on Agoda.com at $439. Lake Placid – Tonight – High Peaks Resort is available to book on Hipmunk at $119. Advance Booking – High Peaks Resort can be booked on Hipmunk at $139, while Whiteface Lodge can be booked on Getaroom for $178 and Mirror Lake Inn can be had on Booking.com at $245. Drawbacks: I like starting hotel searches on Hipmunk, but was disappointed that the calendar feature didn’t work for me. And, although the heat map feature is really cool, it only functioned on my iPhone and iPad. I would love to use it on my laptop. 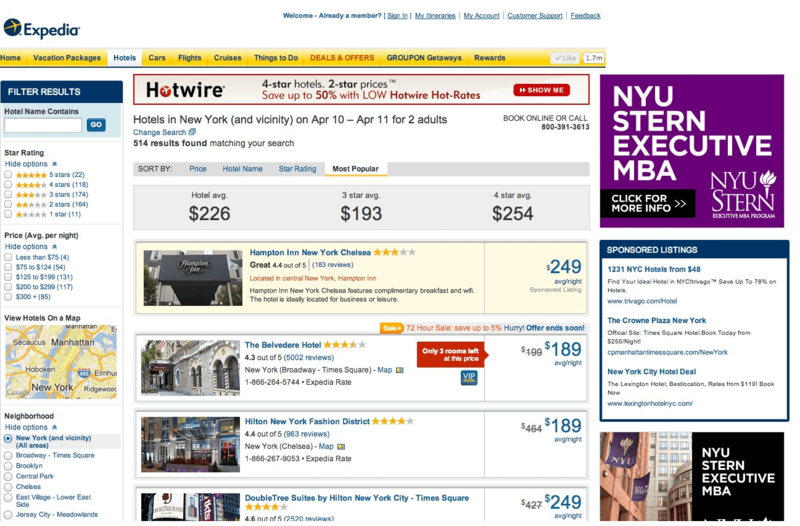 Search results*: New York City – “Win big in New York City, prices dropped an average of $50,” or so says the pop-up window announcing search results. Tonight – 491 properties, including 27 in the Broadway – Times Square neighborhood such as the W New York Times Square, $359. Advance Booking – Of 491 properties, 60 came up when filtering for “Show only money-back hotels.” The W New York Times Square came up again, this time at $599. What are the chances this will drop dramatically by the time of stay? (And yes, that’s the same rate showing up on other search engines–I checked.) “Win big in Lake Placid, 8 hotels saw prices drop (an average of $16.85) in 30 days.” Lake Placid – Tonight – 14 properties, including High Peaks Resort at $139. Advance Booking – 14 properties, but only 9 came ups when filtering for money-back hotels. Both High Peaks Resort ($139) and Whiteface Lodge ($251) made the list. Added value: Money-back tracking. Customer Service by phone 27/7. Drawbacks: Free cancelation is only available to a point, sometimes as much as a week before booked stay. Note – Some frequent hotel guest programs do not offer perks and accrual of points when booking through third parties. Search results*: New York City –Tonight – 326 properties, including Omni Berkshire Place, Midtown East – Grand Central, $279, (NOT direct booking.) Advance Booking – 124 (of 326) available properties, including The Library Hotel in Midtown East, $400. (NOT direct booking.) Lake Placid – Tonight – 9 (out of an inventory of 21 properties) available, including High Peaks Resort, $139. Advance Booking – 15 (out of an inventory of 21 properties) available, including Mirror Lake Inn, $230. Added value: Don’t miss out on loyalty points when you book directly with hotels. Drawbacks: Unfortunately, many of the hotels that come up in Room Key searches do not offer direct booking. Search results*: New York City – Travel guide available for this popular destination; best viewed through a mood-sensitive, color-coded lens. Tonight – 924 properties, including Omni Berkshire Place, Midtown East – Grand Central, $324. Advance booking – 923 properties, including The Library Hotel in Midtown East, $481. Lake Placid – Tonight – 14 properties, including High Peaks Resort, $131. Advance Booking -18 properties, including High Peaks Resort $153, Whiteface Lodge $209, and Mirror Lake Inn $258. Added value: Travel guides for popular destinations. Best price guarantee – If you find a lower price, Momondo will refund the difference as long as you can offer acceptable proof. Drawbacks: Euro-centric, Momondo may be limited on US searches (although it was fine with our searches.) Note – Some frequent hotel guest programs do not offer perks and accrual of points when booking through third parties. Search results*: New York City –Tonight – 338 (out of an inventory of 593) available, the Omni Berkshire Place (which was available on many other hotel booking sites) did not come up on Vayama. Instead, we pulled up The Library Hotel in Midtown East, $399. Advance Booking – 317 (of 593) available; The Library Hotel came up again, this time at $449 and the W New York Times Square at $687. Lake Placid – Tonight – 9 (out of an inventory of 12 properties) available, including High Peaks Resort, $119. Advance Booking – 12 available, including High Peaks Resort $139 and Whiteface Lodge $251. Search results*: New York City –Tonight – 700 hotels available, including the Omni Berkshire Place, $238. Advance Booking – 700 hotels available; including The Library Hotel at $439. Lake Placid – Tonight – 24 available, including High Peaks Resort, $107. Advance Booking – 24 available, including High Peaks Resort $125 and Whiteface Lodge $178 and Mirror Lake Inn $245. Added value: Room IQ (data mining that considers hotel floor plans and front desk interviews.) Lists special rates for seniors, military, and automobile club members. Compares Room 77 search results to multiple search engines. Search results*: New York City –Tonight – 363 (of 538 properties) available, including the Omni Berkshire Place, $329. Advance Booking – 492 (of 661 properties) including The Library Hotel at $439 and the W New York – Times Square, $599. Lake Placid – Tonight – The number of available properties varies with the distance that’s included. We found 11 (of 17) properties available within a 12 mile radius, including High Peaks Resort $119 and Mirror Lake Inn $245. Advance Booking: 15 hotels (of 17) in a 12 mile radius, including Mirror Lake Inn $245 and Whiteface Lodge $251. Added value: Low price guarantee. Secret Deals half off hotels email alerts. Drawbacks: Relatively limited search database and you’re gambling on whether or not prices will drop, rather than rise. Note – Some frequent hotel guest programs do not offer perks and accrual of points when booking through third parties. 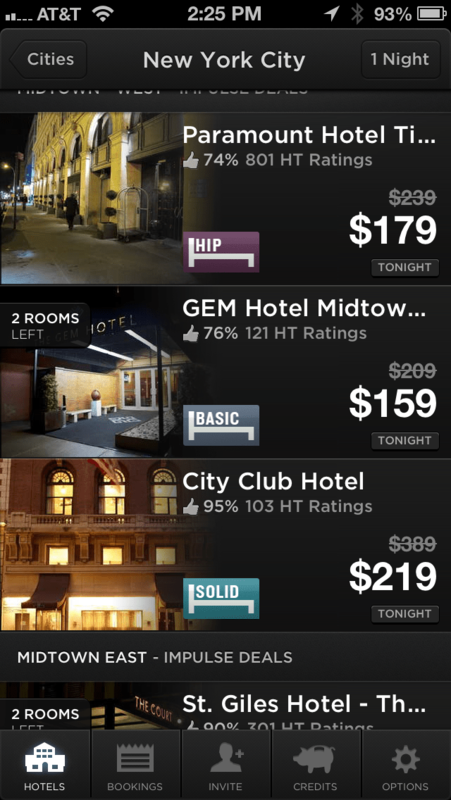 What’s to like: Hotel Tonight offers free app-only hotel booking of same-day unsold hotel inventory. 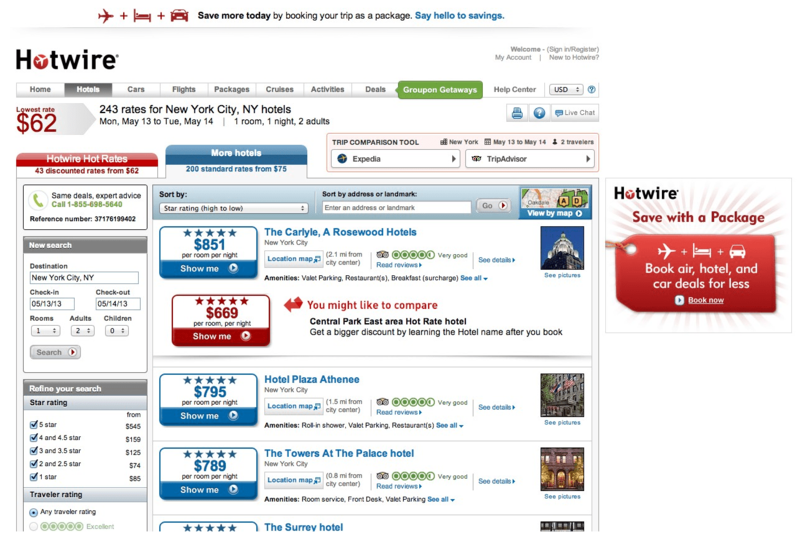 Search results*: Same day – On Thursday, 4/11/13 we found 15 hotels in New York City, sorted by neighborhood, including Hotel on Rivington, $300. 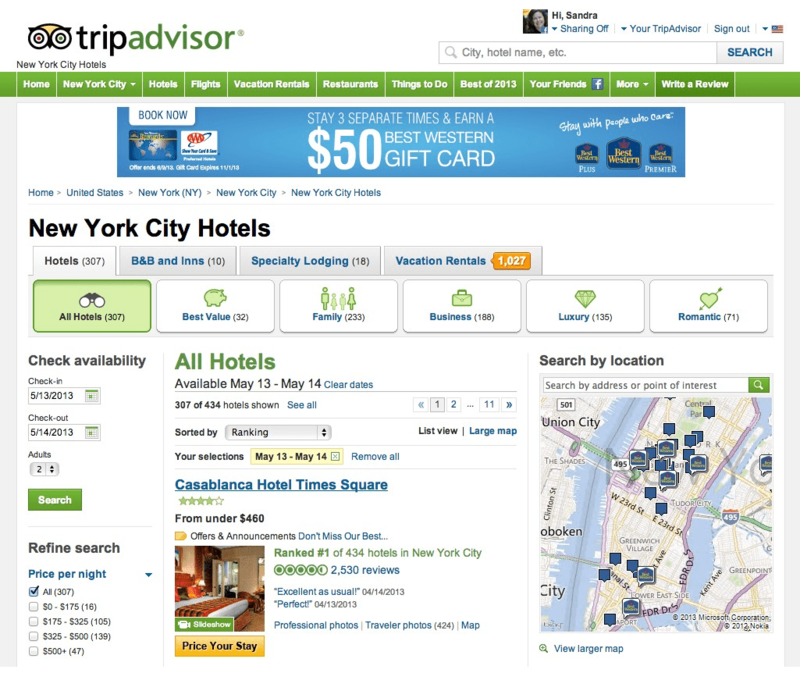 On Friday, 4/12/13 t, Hotel on Rivington was not one of the 12 listings, although it was available on Expedia at $315. Instead, we found a “bonus luxe hotel” listing, Hotel Algonquin, Midtown West, $189. Lake Placid, NY not available at this time. Drawbacks: Not available online and limited selection of participating cities. Note – Some frequent hotel guest programs do not offer perks and accrual of points when booking through third parties. Search results*: New York City – Same Day – 698 properties, including Omni Berkshire Place, Midtown East – Grand Central,$389, with free cancellation. Advance Booking – Brought up 698, including The Library Hotel in Midtown East, $440, with free cancellation. Lake Placid – Same Day – 12 (of 23) hotels available, including High Peaks Resort, $119. Advance Booking – 23 properties, includingHigh Peaks Resort $139, Whiteface Lodge $251 and Mirror Lake Inn $230. Added value: Last minute deals. Customer Support by phone 24/7. Loyalty program – earn one free night for every 10 nights stayed in more than 85,000 partnering hotels worldwide. Added value: Photo-rich website is visually stunning, and three folios–thematic, geographic, and great events–are a wonderful source of inspiration during the initial stages of thinking about a trip. Drawbacks: Might be excellent for finding a vacation package, but not so great when all you want is to find a specific hotel pronto. It’s also just a little creepy that the site “knows” your nearest airport and personal history. What’s to like: JustBook is a hotel booking club that claims to offer discounts of up to 50% off on hand-picked hotels. Search results*: Not useful for our search since it only lists hotels in Europe. Drawbacks: Limited applicability since it only lists hotels in Europe. What’s to like: Not surprisingly, Google Hotel Finder makes full use of its sophisticated search algorithms and Google Maps. So, instead of working through the sorting filters, you can type in “four star hotel in New York City under $400 with WiFi connection.” Of course, you can still use the available search filters: price, star rating, user rating, amenities, and brand. Search results*: New York City – Drag-drop technology of the Custom Area selection tool allows you to pinpoint your search. As a result, I was able to limit the search to specific blocks, resulting in fewer properties but in a smaller target area. Google Hotel Finder excelled at locating available properties, but not prices. Only a few hotels displayed prices, with booking available on other search engines or not at all. No prices came up for the Omni Berkshire, but the link to the hotel site was provided for direct booking. 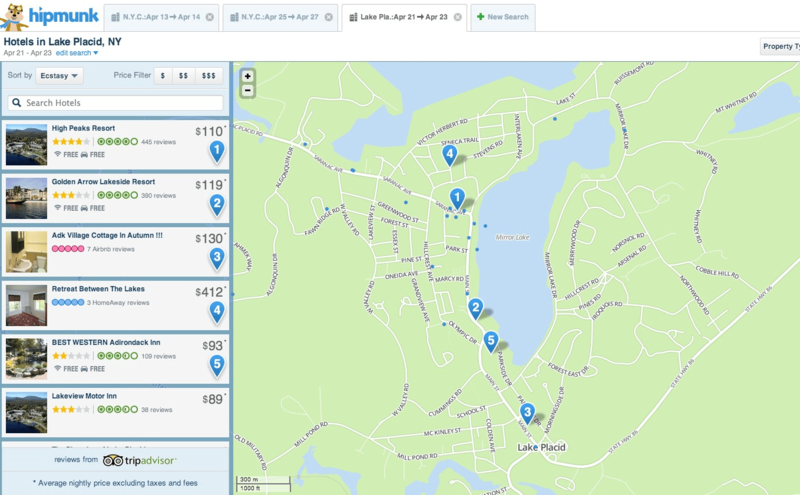 Lake Placid – Surprisingly, our search fared better for Lake Placid, calling up 44 available properties, including High Peaks $129 and Mirror Lake Inn $279. Added value: A rate-trend calendar shows whether the price has risen, or dropped. Also of value are the Zagat and Google user reviews. Drawbacks: Booking is done offsite. 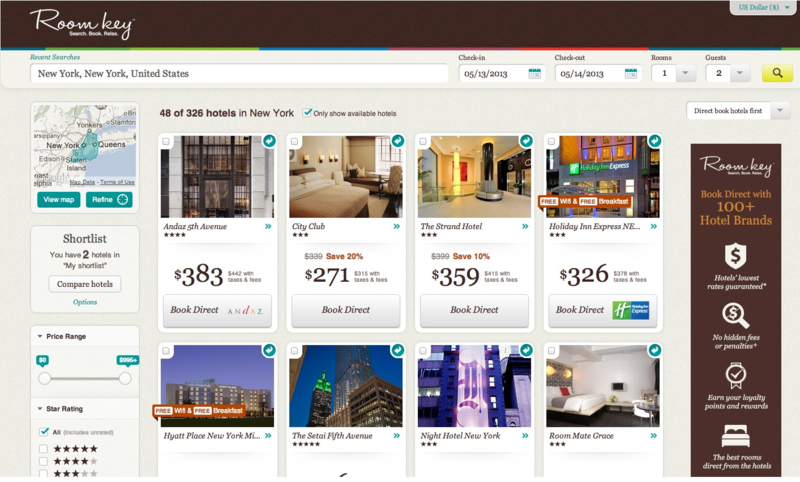 What’s to like: Agoda features 265,000 hotels worldwide, hotel specials listings cover the globe. 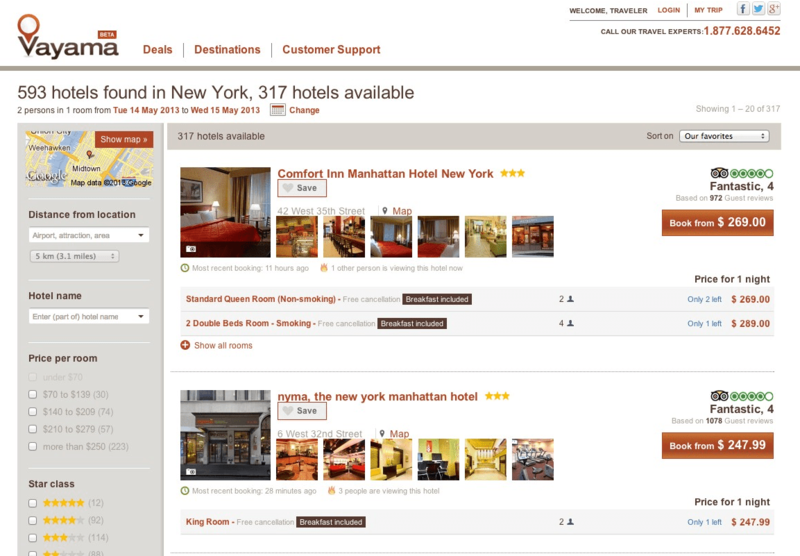 Search filters include: price, map, star rating, hotel facilities, neighborhoods, accommodation type, and brands. 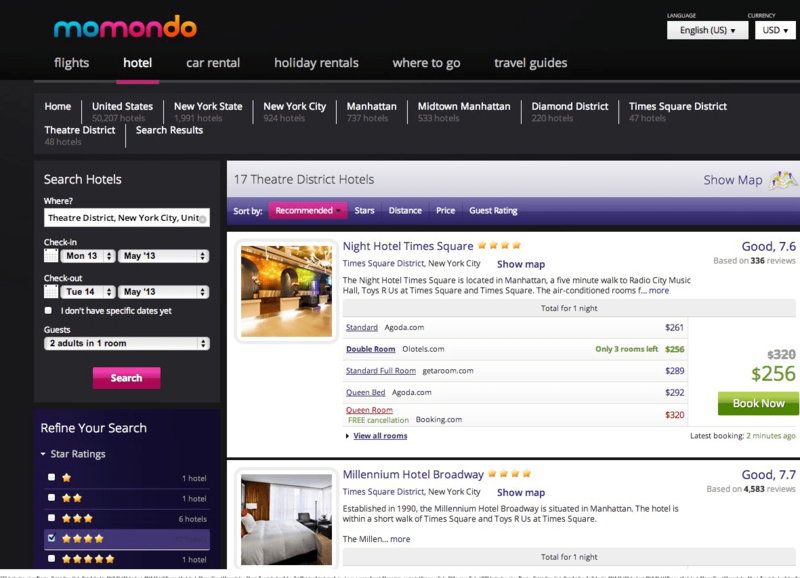 Search results*: New York City – Although Agoda claimed to have 248 available hotels in NYC, search results did not include the Omni Berkshire or the Library Hotel. Lake Placid – 18 properties available, including High Peaks Resort $129 and Mirror Lake Inn $279. Added value: Cash back rewards. Translation available in a multitude of languages. Drawbacks: The web design and search functions are not as sophisticated as other hotel booking sites. Note – Some frequent hotel guest programs do not offer perks and accrual of points when booking through third parties. Search results*: Although Venere.com claimed over 400 hotels in New York City, it didn’t list the Omni Berkshire or the Library Hotel. 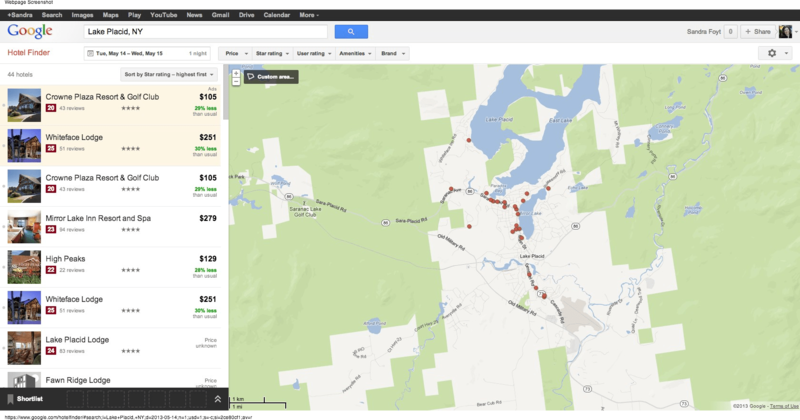 The Lake Placid search pulled up 10 hotels, same prices seen on other search engines. Added value: Phone operators speak 11 languages. Last Minute Travel – Last minute prices on a variety of travel products, including: hotels, flights, cruises, cars, vacation homes, and activities. Trivago – Compare prices for over 730,700 hotels from more than 200 booking sites, such as Expedia, Booking.com, and Priceline.com. Want Me Get Me – hotel search engine lists available perks–from free WiFI to complementary champagne–when booking through site. Rocket Miles – Earn frequent flier miles when booking hotel stays. DealBase – Unbiased listings of thousands of hotel deals from the best hotels worldwide. BackBid – Make a reservation, and then invite hotels to make you a better offer. Foursquare – Check in when arriving at your hotel to receive available upgrades or other rewards. Hostel World – Search through listing of hostels and B&Bs. Airbnb – Travel rentals at unique accommodations in 192 countries. HomeAway – vacation rentals worldwide. HouseTrip – holiday rentals with a protection plan. FlipKey – Over 170,000 vacation rental by TripAdvisor. Tripping.com – world’s largest vacation rental search engine for vacation homes and short-term rentals. With over 2.5 million properties in over 100,000 global destinations, Tripping.com makes it easy to compare prices and availability for millions of vacation rentals around the world from top travel sites including HomeAway, HouseTrip, FlipKey, Booking.com and more. Wow – what a comprehensive review! I just discovered Room77 this weekend – I love the comparisons betweent he different search engines right on one page – no annoying popups! Priceline owns a number of these companies (Kayak, Ogada, Booking.com). You’ll get the same results just using one. The pirate’s there, having got there earlier than you (how did he do this?) and buying the home.